Heat oven to 350°F. Line 2 cookie sheets with cooking parchment paper. Place cookie dough rounds 2 inches apart on cookie sheets. Bake 12 to 16 minutes or until edges are light golden brown. Gently push 1 turtle candy on top of each warm cookie; sprinkle with a little salt. Cool 3 minutes; remove from cookie sheets to cooling racks. Cool completely, about 30 minutes. 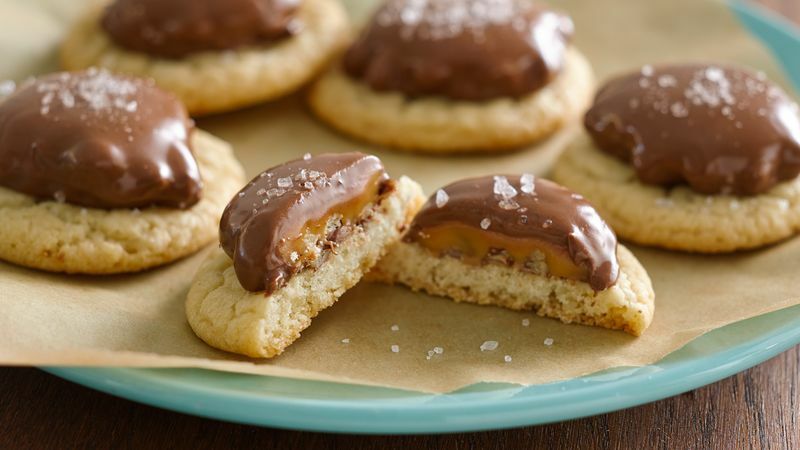 Try another kind of candy on top of these cookies—chocolate mint candies would be delicious. For extra chocolate, substitute chocolate chip cookie dough. Lightly spray baking sheets with cooking spray before lining to keep parchment paper in place.